Raccoons, while fluffy and cute, are not critters you want hanging out in your yard or taking up residence in your attic or basement. 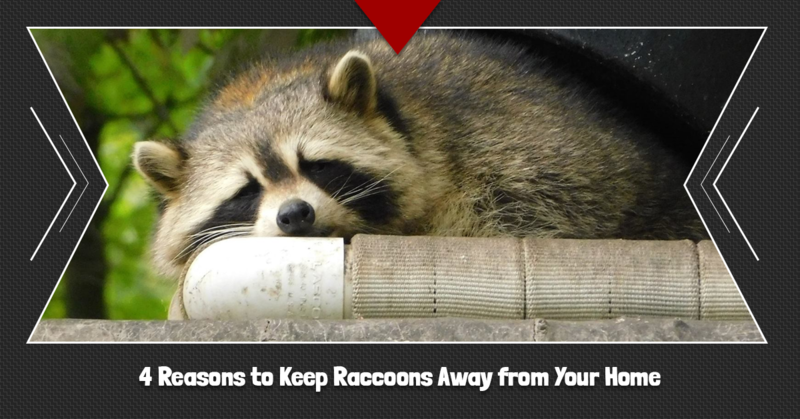 The list of reasons why you want to keep raccoons away from your home is a long one. Today, the experts at Critter Wranglers will share the top four reasons you’ll want to keep these bandit-faced furballs away from your home and out of your life. If you already have a raccoon problem, there’s no need to fear. Your Top Rated Local® raccoon removal team is just a call or a click away! When you need wildlife removal, you can count on us to take care of animals like raccoons, skunks, and a whole swath of other critters quickly, safely, effectively, and in the most humane way possible. Why Keep Raccoons Away from Your Home? In our last post, “How Can I Keep Raccoons Away from My House?”, we shared with you five tips for safeguarding your home from these curious creatures, and here are four reasons why you should follow these tips. The Centers for Disease Control and Prevention reports that terrestrial carnivores like raccoons top the list as wildlife that carries rabies. If bitten, an infected (rabid) raccoon can pass rabies on to any mammal, including humans and pets. Rabies, a preventable viral disease, affects the central nervous system, causing numerous symptoms such as fever, headache, and weakness. As the disease progresses, it causes “disease in the brain and death,” according to the CDC. Like most wild animals, raccoons are unpredictable. While their cute whiskers, ears, and beady eyes may make them seem adorable and approachable, they are wild. If a raccoon feels threatened, it will most likely attack. Plus, being the curious creatures they are, you can’t really predict how they will react when they come into contact with you, your family, and your pets. It’s best to keep your distance from raccoons. Along with carrying a variety of diseases, raccoons have sharp claws and teeth and they are incredibly strong. Because of their characteristics and their unpredictability, raccoons pose a very real threat to people and pets. If they feel threatened and attack, they can inflict significant damage on children, adults, dogs, and cats. Raccoons also pose a threat to property. They are notorious for tipping over trash cans and spreading trash across yards in their hunt for a meal. As they dig through old nasty rubbish, their fur becomes caked with different bacteria. They often urinate and defecate near trash cans and in yards, making a yucky mess that poses a threat to any mammal that becomes exposed to it. Additionally, they use their sharp claws to enter crawlspaces, garages, sheds, and attics in an effort to find a place where they can nest. They will use materials such as cloth, clothing, newspaper, insulation, cardboard, and organic materials to build a cozy, warm nest for themselves and their kits, especially during fall and winter. While it is possible to coexist with these critters, there’s no reason to invite or welcome raccoons into your yard. It’s best to recognize that these creatures are wild animals that can do harm to you, your family, your pets, your yard, and your home. If you notice signs of raccoons on your property, you will want to address the situation immediately. Call Critter Wranglers for a Top Rated Local® raccoon removal and we’ll safely and humanely remove these creatures from your home and property. What’s more, we can animal proof your yard and home to prevent them from coming back in the future. Call the wildlife removal experts who always have your health and safety in mind and find out why we’re Powell’s favorite pest and wildlife removal team. If you’ve had a raccoon problem that has caused damage to your home, learn more about our attic restoration services. Our full-service wildlife removal team can assess the damage caused by raccoons or other wildlife and repair it, which can also prevent a re-infestation. Click or call to learn more!